JOINT BASE LEWIS-MCCHORD, Wash., June 1, 2017 — Chaplain (Lt. Col.) Khallid Shabazz became the Army’s first division-level Muslim chaplain during a May 29 ceremony at the Lewis Main Chapel here. 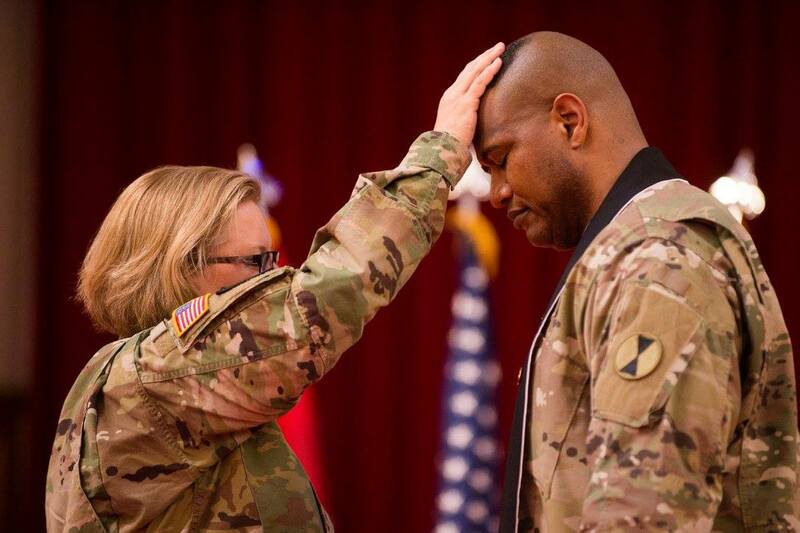 Shabazz became the 7th Infantry Division’s chaplain, succeeding Chaplain (Lt. Col.) Jimmy Nichols, who is headed to Fort Sill, Oklahoma, to be the installation chaplain there. The worldview Shabazz brings, coupled with his experience as a noncommissioned officer, give him a skillset rarely found in the Army Chaplain Corps. He also can identify and address the spiritual needs facing Islamic soldiers today. Still, Shabazz said, he expects some resistance when people see the crescent moon, a symbol of Islam, and realizes some may doubt his ability to serve those of other faiths.